October 12, 2013 By This post may contain affiliate links. These S’mores Coffee Cup Cupcakes may look like real cups of coffee, but when you cut them open you’ll find a graham cracker crust topped with a chocolate cupcake filled with marshmallow cream and covered in chocolate ganache. I’m taking a break from Halloween today to share a few recipes I’ve created for Tablespoon.com. 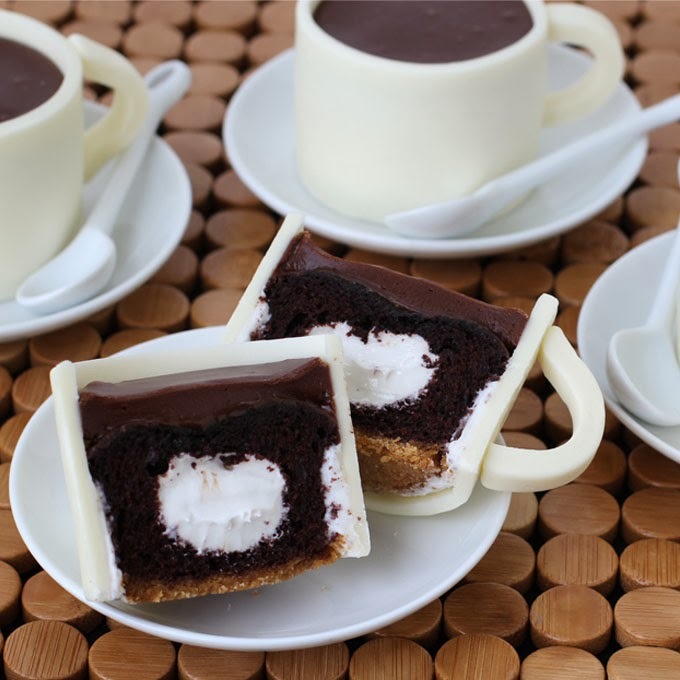 First are some S’mores Coffee Cup Cupcakes. Betty Crocker has a new Hershey’s S’mores Cupcake Mix, and it is my new favorite boxed cake mix. Each chocolate cupcake has a graham cracker crust and an ooey gooey marshmallow center and is topped with a new s’mores frosting. Each cupcake is wrapped in fondant and simply decorated to look like a coffee cup. You can find the directions to make these over at Tablespoon.com. Tablespoon.com has a new look and I created cupcakes to celebrate their new website design. They are now using festive buttons to categorize their recipes and my cupcake designs replicate the buttons. You can use the techniques I show, to create your own cupcake toppers using cookie cutters. I haven't seen the new Betty Crocker Hershey's S'mores Cupcake Mix. It sounds wonderful and I am going to look for it. The coffee cups are so cute! Going to Tablespoon.com now. The boxed mix really is great. I especially like the marshmallow filling inside the cupcake. Krogers just started carrying the mix, and I'm sure it's available in other stores too. That's so nice, Trish. I would have loved to have had a millionaire investor like you back when I opened my candy shops! Thanks, Kim! I have to admit that I really like cake mix cakes, and these s'more cakes really are great. Just so super cute and creative!! Fabulous Work! Just want to grab those chocolate cups and feel the chocolate melting in my mouth. Thank you. I always use modeling chocolate in place of fondant, so biting into one of these you do get a real burst of chocolate flavor. You never cease to astound me. SO COOL!! Stunning the cupcakes, but mostly she's beautiful cup. Good job and very well done. These are SO awesome, Beth! There is creative and then there is crazy creative! I think you are above and beyond! these are so incredible.